According to my taste buds, homemade English muffins are the best English muffins of all. They’re yeasty, chewy, and deliciously-sophisticated. They’re a snap to make, too. If you can whip up a pancake batter, you can whip up some nook-and-cranny bliss. Note: This is my new, improved, recipe for English muffins. It’s even easier than the version I published back in 2012. Another note. 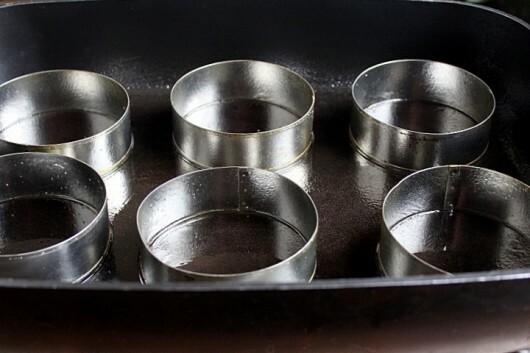 You’ll need some metal rings for this recipe. English muffin rings are 3 1/2 inches in diameter, and 1 1/4 inches deep. I purchased mine from a local kitchen-supply store for $1.75 each. Similar rings can be purchased for a song from Amazon. Here’s the linky. A final note: Let’s make some English muffins! To start, pour 1 cup water and 1/2 cup milk into a glass measure, and heat until warm (100°F) — about 45 seconds in the microwave oven. No microwave oven for you? Use a saucepan, dude. And stir the mixture 100 times in the same direction. Stirring in one direction helps the strands of gluten to develop. (Gluten is the protein in flour that gives wheat breads a wonderfully chewy texture.) 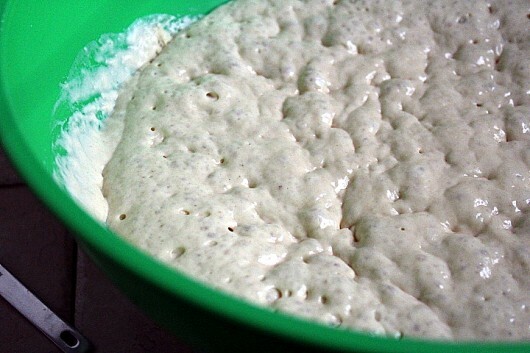 The finished dough will have the consistency of thick pancake batter. Cover the bowl with plastic wrap, and set it someplace warm until the batter doubles in size, and is filled with bubbles — about 1 1/2 hours. 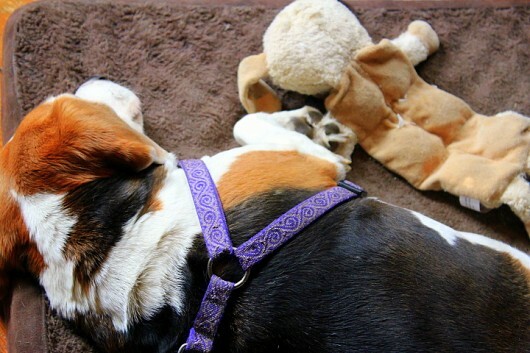 While the batter is rising, snap several pictures of your sleeping beagle, and post them on your Facebook page. And sprinkle it over the batter. Then stir in the same direction 25 times, to deflate the dough and to incorporate the salt. Cover again, and let rest until doubled in volume and bubbly — about 1 1/2 hours. EGAD — IT’S ALIVE!!! It’s great fun to watch the batter bubble and burp towards the end of the second rise. 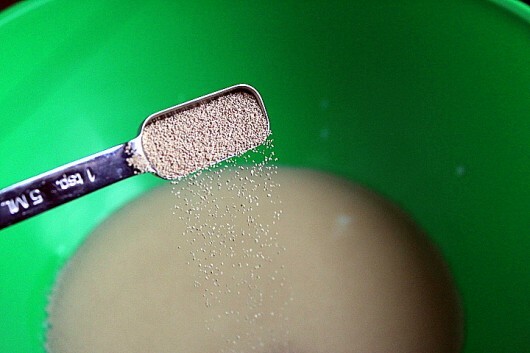 These bubbles create the nook-and-cranny nirvana you want. 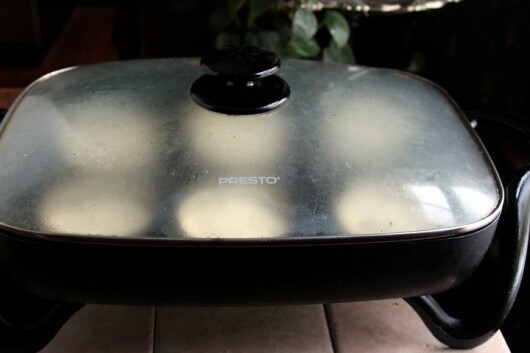 Now arrange the metal rings in a large skillet set over a medium-low flame, or in an electric skillet preheated to 300°F. Spray the inside of the rings and the surface below them with vegetable spray. Oh. 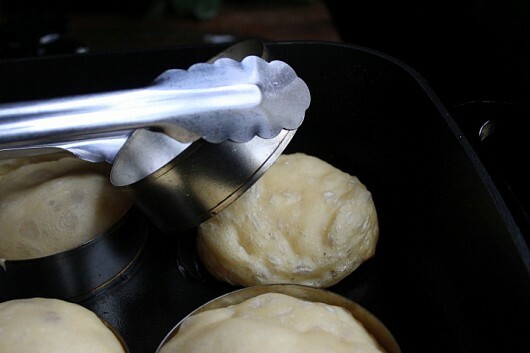 Need an inexpensive electric skillet for your English muffin-making adventures? I use this one. Then ladle the thick, sticky batter into the rings, filling them no more than halfway full. Cover the skillet, and cook until the tops of the muffins feel dry to the touch — about 8 minutes. And flip the muffins over. Cover the skillet, and bake until done — 4-5 minutes. Transfer the muffins to a wire rack, and let ’em cool to room temperature. 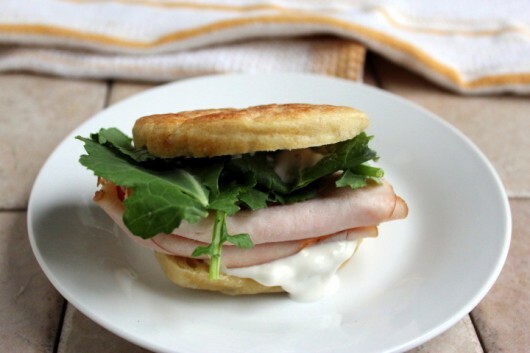 Brace yourself for something that puts store-bought English muffins to shame. And as-is (or toasted) for superior sandwich and hamburger buns. I hope you’ll give these English muffins a try. Again, the’re easy to make, and heaven to eat. They freeze perfectly well, too. Just seal them in a plastic bag after they’ve cooled. Hungry for more? Get my email updates. And to make my life worth living, post a comment below! NOTES: Feel free to double the batter. Left over muffins can be frozen. Just let them come to room temperature first, and then seal them in a plastic bag. Sounds wonderful.. What can I use instead of milk? I have a dairy free child. And would you be able to make sour dough english muffins. Hi Maureen – First, welcome aboard. 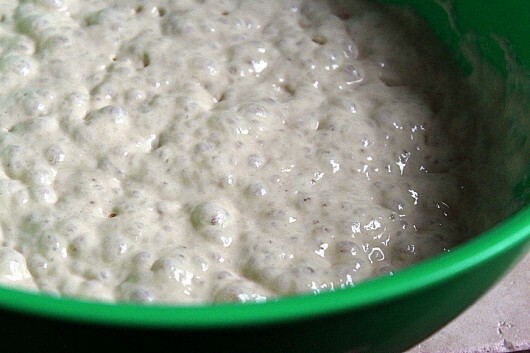 And next, you can use 1/2 cup (4 oz) sourdough starter in place of the active dry yeast. 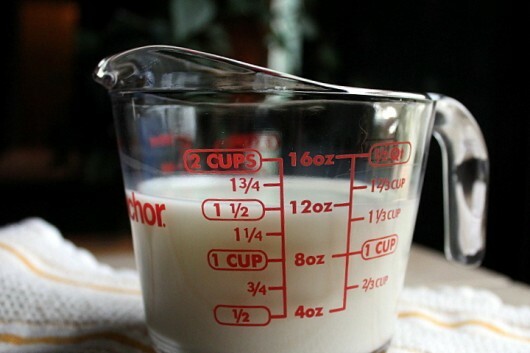 Omit the milk, and use 1 1/2 cups warm (100°F) water. Instead of 2 rises, just let the batter rise at room temperature overnight. I love this recipe. I have NEVER see a EM recipe and dislike store bought. I have printed & will try it. love the fancy purple bling on your beagle. She has class. Do you think canning jar rings would work? This looks like a recipe that even I could do. I had no idea I could use my electric skillet in this manner. Thank you, Kevin! Wow, I am impressed AGAIN! Those metal rings are the bomb. Does Lily’s nap time “toy” have a name? When is the cookbook coming? Love making english muffins !! They make wonderful rings to use for muffins and eggs ..
Hi GB – I’m working my fingers to the bone to get the cookbook finished. Taking pictures now. Thanks for asking! Am thinking that the Orange Blossom Honey I brought back to Minnesota from Florida will be wonderful on these … can hardly wait to try these! This sounds perfect for me having a cabin without electricity, only a gas stove with no oven. Kevin, have you ever tried these EM’s using bread flour? If so, what was the result? I recently discovered your site, and love it! Hi Kevin! I purchased the rings (they look like yours) from Williams Sonoma yesterday, and made these babies. THEY ARE AMAZING. And so easy! You are right — the difference between store bought and homemade is night and day. Thanks for the clear directions. I’m going to make a double batch now! Hi Maraya – Welcome aboard! I’ve not tried the muffins with bread flour. But if you do, please report the results! Hi Catharine R – I’m so glad you tried — and liked — the muffins. Enjoy your double-batch project! 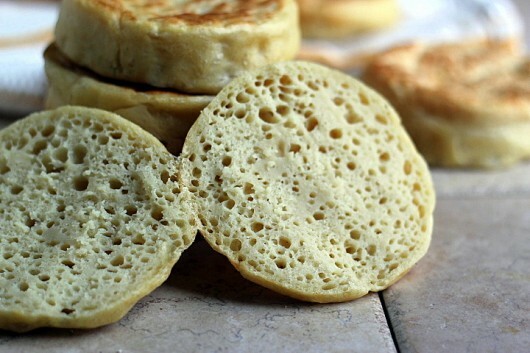 Crumpets” but they’re hard to get because everyone loves them and any new stock disappears very quickly – so a recipe for them would be just wonderful! Hi Kevin, I will definitely try these muffins. Can hardly wait to go buy the yeast and the frying pan today! By the way, can you post an easy recipe for Pop-Overs? I had lunch at Neiman Marcus the other day and loved the muffins they serve with every order. Hi Verlie – Like you, I adore crumpets. Recipe coming soon! Hi Kay – I published my recipe for popovers a few years ago. Click here to see the step-by-step: Perfect Popovers. Kevin thank you so much! What a lovely surprise to see the words English muffins in my email this morning. I’m going to make them right now! Knowing the recipe is from you l know it will be amazing. I’m anxious to try these muffins. My husband and I agree that all of the recipes you’ve shared and I’ve tried are “keepers”. 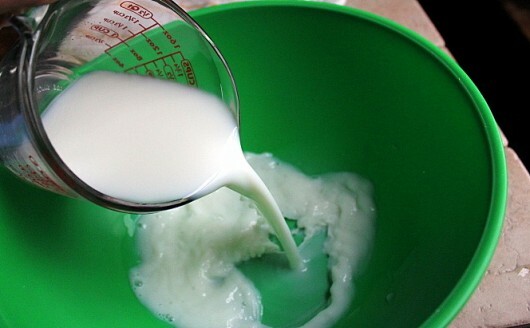 As for the homemade butter pictured, ….. it’s to die for! I’ve made two batches and George keeps looking for more! English muffins topped with gruyere. This recipe sounds and looks better than any I’ve tried before…and never repeated. This looks like a keeper. 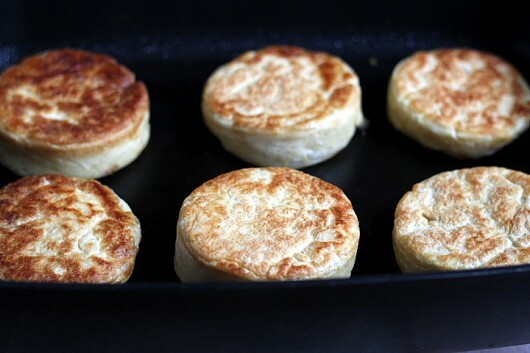 Can these English Muffins be baked in Electric stove oven? I want to make these. Is there any reason this couldn’t be mixed in a stand mixer? 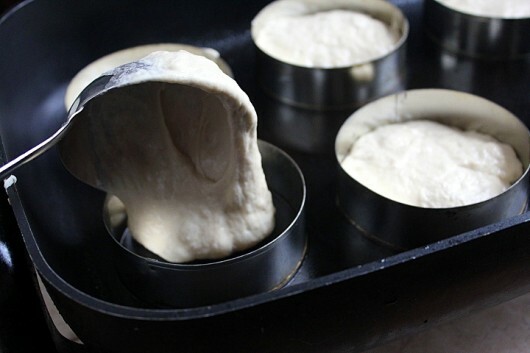 Hi Jean Bulger – These muffins are intended for stove top (or electric skillet) baking. Hi Lana – My “print recipe” program doesn’t include the picture, simply because so many people complained that pictures waste printer ink. Sorry about that! Hi Lainey – You can use a standing mixer if you wish, but you certainly don’t have to. 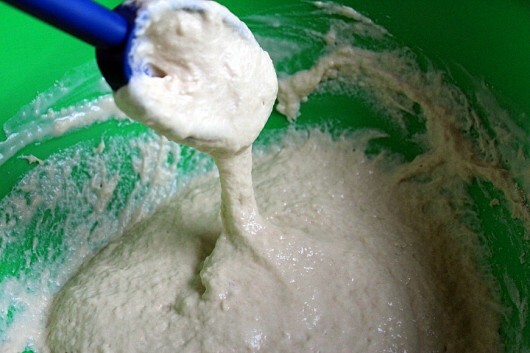 It’s a no-knead batter than involves less than 2 minutes worth of stirring. 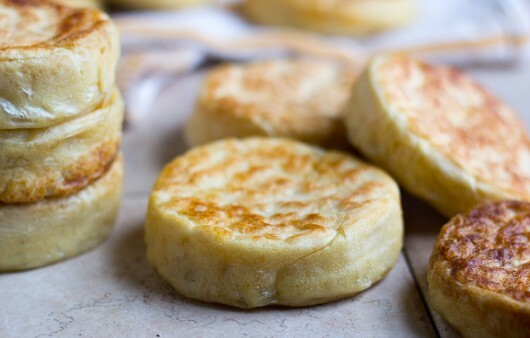 This English muffin recipe looks quite easy. The great way you explain things makes me believe it’s possible. Thanks for all the time you take, to make cooking enjoyable. pig-out on them all at once, maybe I can enjoy these. They look wonderful! My electric frying pan (as we call them in Oz) doesn’t give temperatures such as 300 degrees etc – it just says high, medium or low. Any idea what setting would equate to the 300 degrees? Hi Linda A – I hear you! Hi Jean J – My best advice? Try “medium” heat. If the muffins are too brown when you flip them over, lower the heat just a tad. Hope this was helpful to you! My mouth is actually watering! Maybe a slice of Theuret tomato later on? Just put my Theuret’s under the lights so they may begin to grow into their deliciousness. These look so good…I copied the recipe…But was wondering if you could use whole wheat flour. hi Kevin, can I use all purpose gluten free flour? Oh how i miss bread, haven’t had a piece in 6 yrs. I cannot wait to try these muffins! I love quick and easy recipes to try when I come home from work! I have read (and may have used) tuna cans with top and bottom removed for english muffin rings. I did buy some at one time but am not sure if I still have them. I made these over 20 years ago when they were not available where I lived…best ever eaten! I may have to try again…wonder if I can find the rings or tuna cans that would work? Also…where do you find a skillet that large with a lid? Hi Patti – Probably you could get away with 50/50 whole wheat/all-purpose flour. 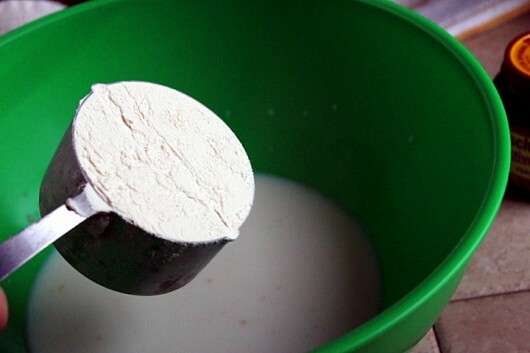 Hi Vivian – I’ve never tried these with gluten-free flour. Sorry! Hi Cathy Geha – I ordered my electric skillet from Amazon. If you click the highlighted text under the 14th picture above (“I use this one”) you can read more about the skillet, and order it, if you wish. I have stiff hands and wrists from 25+ years of being a massage therapist so I’d prefer to use my candy-apple red standing mixer. Would you suggest the paddle or which attachment? Blankety-blank spell check! That should have read paddle or whisk attachment – geez! Thanks Kevin for sharing this recipe. I made some years ago and they turned out nothing like this so will use this one. Will try and make it with sourdough too. Hi Addie – From what I’ve read, English muffins were invented by a British ex pat named Samuel Bath Thomas. Thomas opened a bakery in NYC in the 1880s, and sold the muffins as “Toaster Crumpets.” In regards to a standing mixer, well, I’ve never used one to make these muffins. So my best advice is to whisk the water, milk, and yeast by hand for 2 seconds. 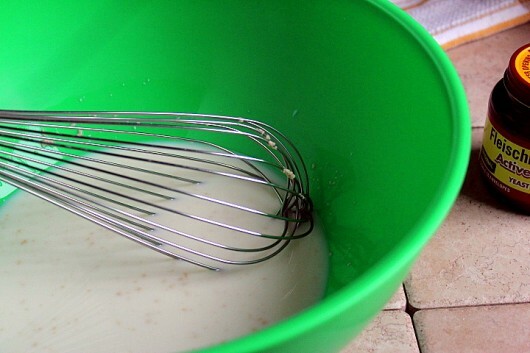 Then hook up the paddle attachment to your mixer, and blend, at the lowest speed, the batter for exactly 100 revolutions. 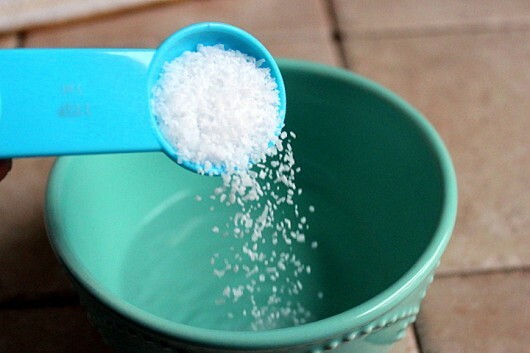 Later, when you add the dissolved salt, blend for exactly 25 revolutions. Hope this works for you! Ha! I will have to enlighten my Brit about these facts (not that he ever eats them – the muffins, I mean. Oh good heavens!! Is that home made Orange Marmalade on your muffins? Do you have the recipe for it? I refuse to buy store bought, it’s just not like home made which I haven’t had in years! I just made these with canning lids and it works. They are thinner and you have to flip them with the ring on as there is a little lip on one side of rings. I also used a water chestnut can as another person mentioned and that works as well. I ordered the rings you recommended, and they arrived with a recipe that differs from yours. There’s a LOT more flour in their recipe, a little less salt, and some butter. The second rise is done in the rings, and they are baked at a much higher temperature. Now I’m confused. Did you experiment with various recipes before discovering the best one? Delicious! 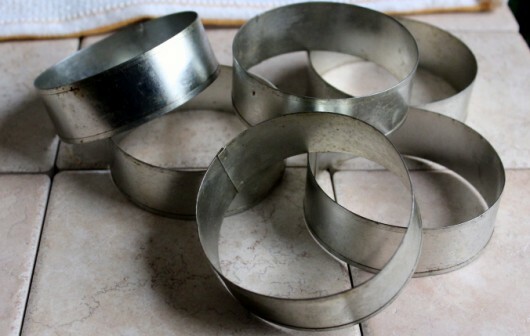 I bought 4 circular cookie cutters and made these last Sunday. Starting another batch now. Thank you, Kevin! Hello! I stumbled across your site when I was looking for cottage cheese pancake recipes. I really enjoy your writing style and quirky sense of humor. I explored the entire site, and I was inspired by severa articles. I can hardly wait to get into my kitchen tomorrow to try several of these delicious looking recipes …. Starting with the one above! Thank you for taking the time to share your creativity and talents with others. OK, first, this is an awesome recipe! I’ve been looking for a great english muffin recipe for two years. This is it. And here’s how I made it work for my covered skillet (also a Presto) which did not cook as hot as was referenced in the post. As far as ingredients, this is spot on. 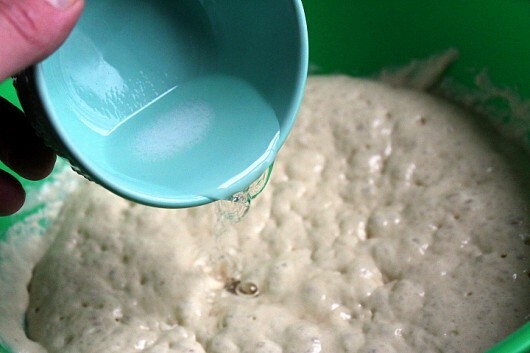 It produces a high hydration dough which is spooned, or as stated, ladled. Really! I made it twice this morning and ended with approximately 700 grams of very wet dough. So, I sat the work bowl on my kitchen scale and did a little subtracting to get 6 even sized muffins. And wait until you smell the aroma of this cooking. But, my cook time was very different. To get a completely cooked muffin, I went to 350 degrees for 9 minutes, removed rings and flipped. Cooking covered, another 9 minutes. Then I turned them once again (cover off) and let them sit in the pan for an additional 5 minutes. Make sure to let them cool before cutting with a muffin splitter (to give the best nooks and crannys). At 6 muffins calories are around 200 each. Next I’m going to try to get the fiber up. I made the homemade English muffins and bean burgers-delicious!!! 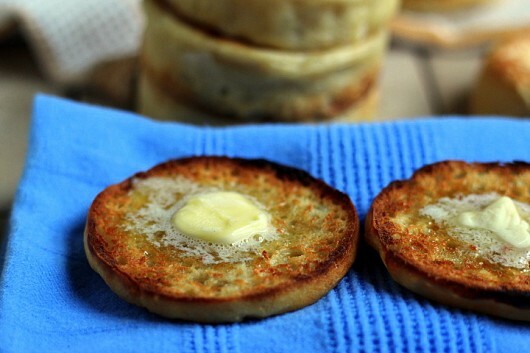 The English muffins to die for. Thank you Thank you!!!!! I cannot believe that I actually did this. Hi Meghan – Thanks for taking the time to write. Kudos to you! I wondered about using gluten-free flour as well, but you mentioned in your video that the stirring activates the gluten in the batter, so wouldn’t using gluten-free flour defeat this objective and affect the texture, etc? Hi Linda – Let me know how the muffins turn out for you! Hi Addie – I’ve never made English muffins with gluten-free flour. I get so excited when I see your emails in my inbox! You have an amazing sense of humor and you really make my day! Thank you for the funny, clever words. Oh…. and all of the wonderful recipes! By the way your new kitchen is beautiful. Now… time to go make those English muffins! Big huge hugs to you from Northern California! 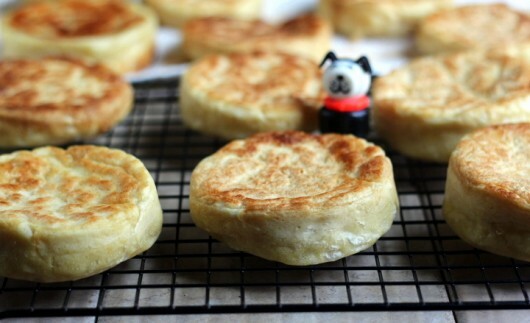 I am very happy to see an easy recipe for english muffins. I can’t wait to try them this comin weekend. Tried them today. They are yummy. Never realized 100 stirs tests arm muscles. Thanks, Kevin! You’re welcome, Annie. So glad you liked the muffins! Oh Kevin! I made these yesterday and everyone is correct! Easy to make, used the rings (from your link), added delicious cherry blueberry jam and lots of butter after I toasted one this morning! I Will Never Buy Them At The Grocery Again! Hi Susan J – So glad the muffins worked out for you. I’m with you — no more store-bought English Muffins!